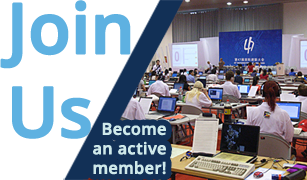 Become an active member of Intersteno! speed writings can make easier your personal and professional work. Are you an institution, a firm or simply an interested person? You can become ‘Associated or Individual member’ of our community. This is not an automatic process, you must be approved by the Intersteno Council and Board. Please read art. 3 and 4 of the Constitution. Associated members can be companies, associations or other organizations and parliamentary reporting services, whose membership is of importance for the enlargement of the working field of the Federation. The annual contribution is 175,00 EURO. Also private persons are welcome to support Intersteno activity as individual members. The annual contribution is 45,00 EURO. Individual members are listed in the INTERSTENO website with their name and country. Both associated members and individual members are entitled to vote in the INTERSTENO Council, which takes final decisions on many important aspects of the life of Intersteno. Once your application has been submitted and your membership fee received, you will be contacted by our Secretary-Treasurer. Your application will be reviewed and submitted to the Intersteno Council for approval. If your application is NOT approved, your membership fee will be refunded in its entirety. For any additional information, please contact Ms. Linda Drake (drake.linda317@gmail.com or lucy3171@comcast.net) who coordinates and facilitates relationships with Associated and Individual members.